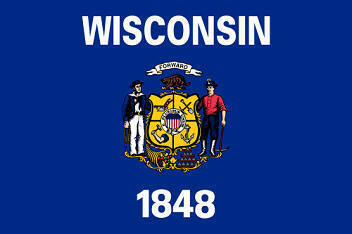 The blue State Flag of Wisconsin proudly displays the name of the state in white together with 1848, the date of statehood. The image is taken from the seal of state a features the coat of arms supported by a sailor and a miner who represent the mining and shipping industries. There is a strict Order of Precedence for flags. State Flags are displayed in order as they entered the Union. Car Flags are often displayed to represent of an individual's allegiance to their state. Wisconsin State car flags are used by their owners as mobile emblems of their home. Car flags are usually made from strong materials and are attached to a car via a pole and clip window attachment. What is the design of the Wisconsin state flag? What do the male figures symbolize? What does the badger symbolize? What does the shield symbolize? 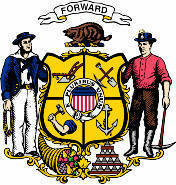 The shield is based on the state's coat of arms containing pictures to represent the occupations which Wisconsin is known for including agriculture (the plow), mining (the pick and shovel), manufacturing (the arm and hammer) and navigation (the anchor). What is the history of the Wisconsin State Flag? 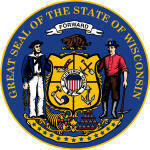 The Wisconsin flag is kept and used as required by the code specified in the constitution of the state.